It is rare that a long weekend comes and goes with out us going to the cottage. It is also rare that a cottage weekend comes and goes with out me making some sort of delicious treat. 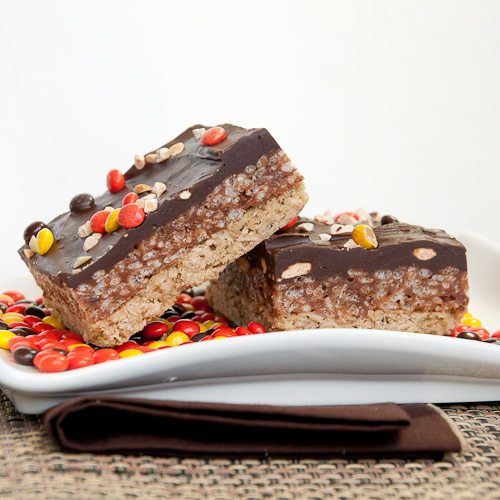 I always tend to do a quick snacking dessert like cookies, quick breads, brownies or bars. Something you can quickly grab before heading down to the dock or while casually reading in the sun room. Maybe even after an nice mid day nap. I also tend to try and incorporate peanut butter and chocolate. Long weekends at the cottages are often a family affair so I like to appeal to the masses as several seem to have a peanut butter and chocolate dessert addiction. I came across this recipe in a one of my daily dessert emails. Some I keep and send to the baking folder and some I delete. Most desserts that pop up chocolate and peanut butter are keepers. 1) Preheat oven to 350F. Combine first 5 ingredients in a medium bowl into a moist crumb. Press firmly onto bottom of a sprayed and tin foil lined 9x13 pan. Bake 12 minutes. Let cool on a wire rack 10 minutes. 2) In a sauce pan on medium to low heat, combine corn syrup, sugar, and peanut butter. Stir until melted and smooth. 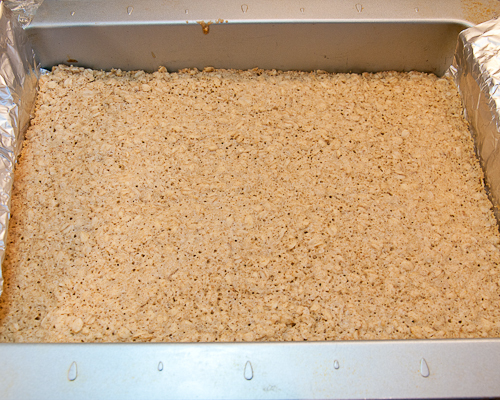 Stir in cereal, until all krispies are coated and press into pan on top of the oat mixture. 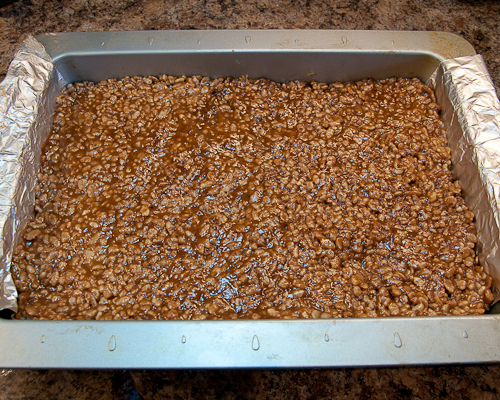 3) Using a double boiler, melt dark chocolate and peanut butter, stir until smooth. 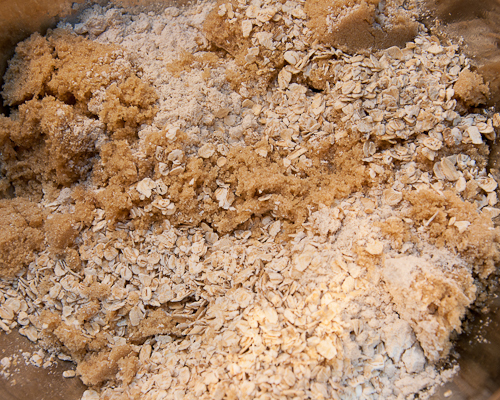 Spread over cereal mixture using an offset spatula. 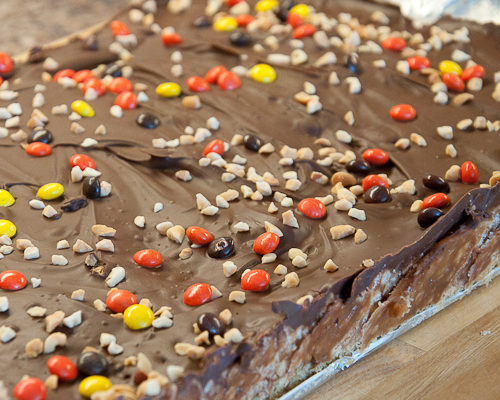 Sprinkle with chopped peanuts and reeses pieces. Cool at least 45 minutes. Cut into bars. It is very hard to go wrong with chocolate and peanut butter but I felt like these bars were one layer too many. 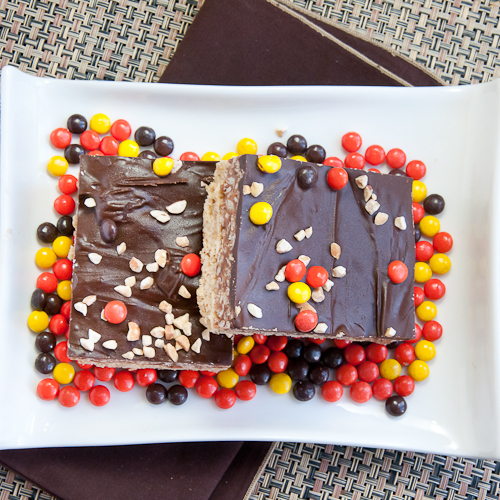 I didn`t feel the oat layer added anything special to the bar and if anything only took away from the peanut butter and chocolate combination. Next time I make this I will remove the oatmeal base and try to figure out another recipe I could use it for. It did have a great crunchy oat texture just didn't fit with this bar. Wow Those all look Great!!!! !